Back from the visit to the Russian Coating Association, OKCHEM team went to meet another important organization in the coating industry, the Market Guide Agency, this week. The Market Guide Agency has been engaged in marketing and sales strategies for the past 20 years, especially in paint & coatings industry and industrial chemistry, and has cooperated with many famous companies and associations home and abroad, such as Dow, Dupont, Russian Coatings, Yaroslavl Coatings, Centrlak, etc. Besides, it owns two Paint & Coating Magazines, i.e. the Industrial Paint and the Paint Materials and Their Applications. 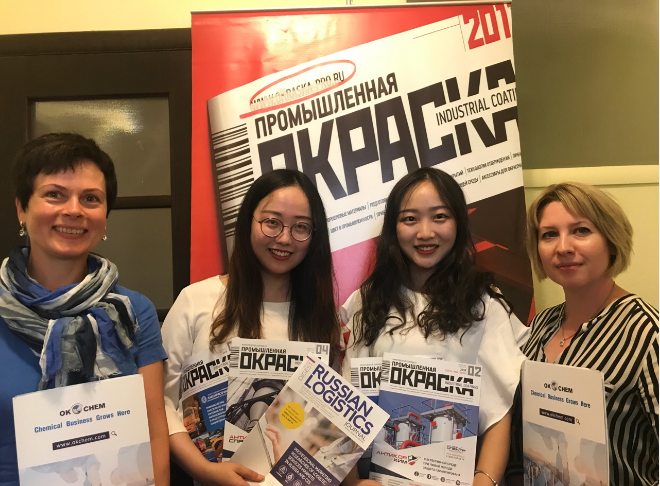 In this visit, Yulia Kislova, the general manager of the Market Guide Agency, made a detailed introduction about the Industrial Paint magazine to our OKCHEM team. It is published in the Russian-speaking countries including Belarus, Ukraine, Kazakhstan, etc, and covers the analysis of coating market, news, exhibition information, and so on. Most of the magazine subscribers come from the coating industry. As a leader of the Market Guide Agency, Yulia Kislova is also an expert in the coating field. She is very experienced in this industry and has worked in Yaroslavl Coatings for 8 years after graduation, mainly responsible for marketing and promotion. In our meeting, Yulia gave us some great suggestions about OKCHEM marketing promotion in Russia, and said that she would be very glad to help our suppliers connect and do business with the Russian buyers. Our Russian team is preparing the cooperative details and we hope to start cooperation soon. With the two successive visits to the most professional agencies of the coating industry in Russia, we have got a better understanding about the local coating market. When our overseas team start the cooperation with these organizations, we will help the OKCHEM suppliers and buyers get access to enormous business opportunities in the Russian market. OKCHEM, as the professional chemical B2B platform, will bridge the chemical suppliers and buyers and provide them the best solutions in Russia with our localized marketing.